The HERCULES project would like to announce the launch of HERCULES Labs, our new online tool for the landscape community to browse and share ideas about good practices in landscape management. A key objective of the HERCULES project is to strengthen the collaborative network of the landscape community. One way to do this is through the collection and dissemination of good landscape practices. 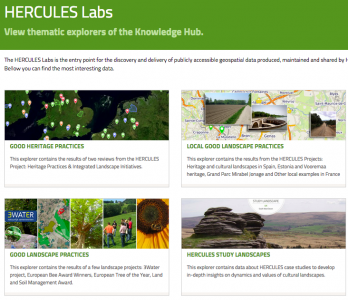 We have developed an online tool called HERCULES Labs where members of the landscape community, be they practitioners, policy makers or scientists, can view a diverse range of good practices and initiatives that we have already gathered in our work, as well as add their own ideas and perspectives. Landscape management is uniquely challenging in that it is embedded in environmental, economic, and social contexts. By sharing your work, you help other people to learn from your experiences in addressing these challenges, and you too can be inspired by the creative and insightful approaches others have found. Now we invite you to use HERCULES Labs, browse the practices, and participate in this growing and exciting community by contributing your own examples of good landscape management. Two project members, Claudia Bieling and Tobias Plieninger, are editing a book: The Science and Practice of Landscape Stewardship, to be published by Cambridge University Press. We will select examples from the entries in HERCULES Labs to feature as case-study examples of good landscape management in this book. These entries will also feature individually on our Cultural Landscapes Blog, which we will use to highlight diverse and insightful examples of good landscape management. These case study examples will show context, aims, and functioning of the approaches, and will end with concrete “lessons learnt” that are instructive for application elsewhere. Each case will be accompanied by a compelling photograph illustrating its particular example of landscape stewardship in practice. - An artist’s initiative advocating sustainable human-nature relationships by offering sensory experiences with the local landscape. To read more about the emerging field of landscape stewardship, have a look at some of our other blog posts on the topic. So go to HERCULES Labs to browse examples of good landscape practices, or contribute your own examples in the form directly below and help grow this resource for our landscape community. For any questions, comments about this blog post or about HERCULES Labs, you can contact us by email, or post a comment below.